Mollie's Story from Jay Inman on Vimeo. The day Mollie Inman was born, everything about their baby seemed normal to her parents. However, what was in store for the next couple of days proved to be very challenging for the family. The next day , Mollie’s doctors discovered something wrong with her heart. After a series of hourly exams, unusual signs troubled Mollie’s pediatrician. After an emergency telemedicine consultation, Mollie was flown to Children’s National Health System. 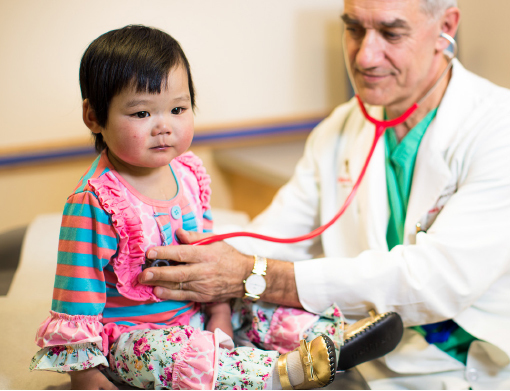 Craig Sable, MD, and the Pediatric Cardiology team diagnosed Mollie with coronary artery fistula to the right atrium, a very rare cause of heart failure in newborns. Mollie’s coronary artery was 15 times the size of a normal artery for a newborn and would require immediate surgery to correct. Then, things took a turn for the worse. The night before her surgery, all of Mollie’s major organs began to shut down. “I thought we’d lose her,” recalled Mollie’s mom. The care team of doctors and nurses were determined to deliver on the promise of a normal life for Mollie. “They helped her live that night,” Mollie’s mom said. The next morning, doctors moved ahead with the surgery plans as Mollie now faced a 50/50 chance of survival. The surgery was successful in closing the communication between the coronary artery and Mollie’s right atrium. “We feel she was healed,” Mollie’s mom expressed, grateful for all of the care team’s efforts. After spending three weeks recovering at Children’s, Mollie was able to go back home. She continued to visit Children’s for follow up check-ups every three to six months during infancy and then annually ever since to see Gerard Martin, MD. “It’s been a blessing. It’s always been good news at her routine follow-ups,” says Mollie’s mom, “She loves the fact that she was able to see Dr. Martin consistently ever since she can remember.” As she got older with Children’s, Mollie’s visits became less frequent as her coronary artery shrunk to just three times the size of a normal adult. Mollie has more than just overcome her initial odds of survival, she has thrived. When Mollie picked up sports and physical activity, her mom shook off her nerves, “She just came out stronger every time.” Mollie has been playing basketball since fourth grade. “My condition has never really bothered me so it has never kept me from doing anything in life,” says Mollie. An even bigger passion of hers has been singing. She has been singing her entire life, with church youth groups, her high school choir and a cappella group, and most recently, Mollie auditioned for NBC’s The Voice. Having just celebrated her 18th birthday, Mollie is set to attend Walter State Community College in Morristown, TN, on a choral scholarship. Due to the incredible work of cardiologists at Children’s National, Mollie has been able to pursue her dreams and grow up stronger each and every day. For more videos of Mollie, check out her YouTube page.